Even without the Downing Street memo, the mass murders of 9/11 were enough to show us that the war on Iraq was already inevitable – indeed, as we’ve just learned this week, the war was already underway while we stood on the grass in the millions trying to prevent it. When Senator Paul Wellstone’s plane crashed near Eveleth, Minnesota on Friday, October 25, 2002, killing him, his wife, his daughter, three aides, the pilot, and the co-pilot, a casual observer might have forecast a simple investigation by the National Transportation Safety Board (NTSB). The mass media widely reported bad weather in the area—freezing rain, snow, icing, and fog, with poor visibility—and implied that the weather had caused the crash. More than a year later, however, the NTSB’s 63-page Final Report1 answered few questions, and left a huge void in the public record for those wishing to understand the death of the outspoken Senator. Despite having released over 2,300 pages of Factual Reports and supporting documents2 to the public during the course of its investigations, the NTSB’s Final Report does not address the most fundamental questions surrounding the crash. 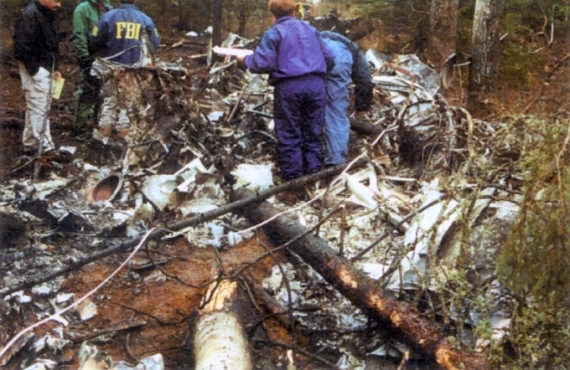 Moreover, even the very presence of the FBI during the investigation of the crash site was almost completely eliminated from the documents that were released—let alone the results of the FBI’s investigations—despite an abundance of evidence that its agents were on site before members of the NTSB, and continued to play a major role at the crash site in the days that followed. Another view of the fuselage, this time from behind. (The yellow arrow is the NTSB's; it points to a rear passenger door.) It is unexplained how the tree remained unburned. 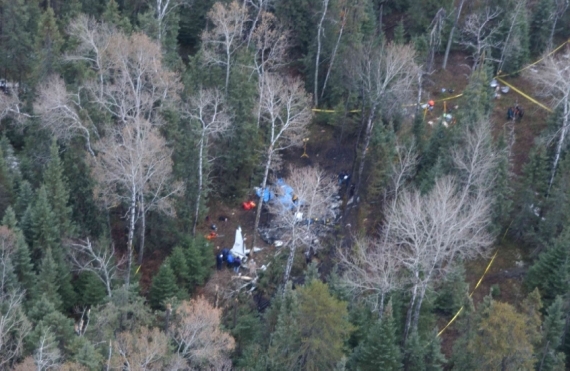 Aerial view of the crash site, reportedly taken the day after the accident from a State Police helicopter, at the request of the NTSB. One would think that this seven-and-a-half-hour fire deserved investigation. 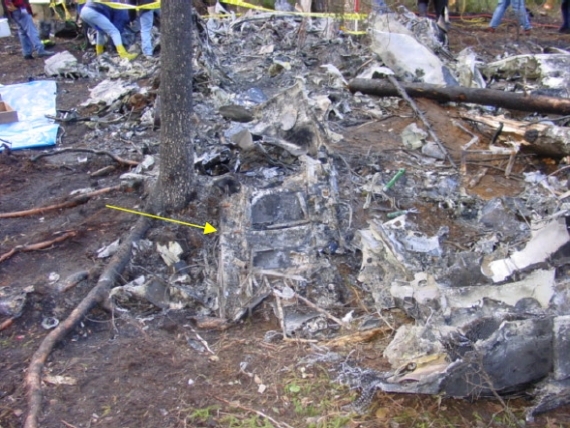 Photographs released by the NTSB show that the fuselage was reduced to ashes, and all that remained of the seats were disconnected frames.38 The victims were only discovered as a by-product of the search through the ashes for the Cockpit Voice Recorder,39 and were only identified by the Medical Examiner through dental records.40 In turn, the search for the Cockpit Voice Recorder lasted a day, until it was discovered that the plane had none.41 One might think that the owners of the plane should have informed the NTSB of this fact before the fire was even extinguished. Another aerial view of the crash site, taken from slightly further away. The NTSB never explained why the pilots turned the plane south - away from the airport - in the last seconds of the fatal flight. This photo suggests that they chose this grove of less-sturdy tress to soften their crash landing. 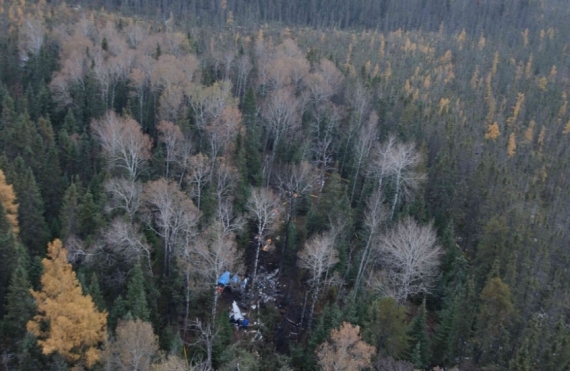 The NTSB found that the plane descended through the trees with wings level, but at a steep angle of 26 degrees. The NTSB obtained statements from at least three witnesses that the engines of the Senator’s plane went quiet just before the plane crashed,71 and one witness who said the engines “quit suddenly” and went “completely quiet” when the plane was at least five miles from the airport.72 However, the NTSB does not explain the ramifications of these observations. The plane was equipped with “constant speed” propellers,73 which automatically adjust the angle that they cut through the air, to allow the turbine engine to continue turning at a constant, optimal RPM (like a gearbox in a car, but able to continually “shift gears” to keep the engine at its best RPM).74 The witnesses were surprised to hear the engines almost cut off, because they were accustomed to hearing planes landing at EVM airport, for which the engines keep the same RPM, and the sound slowly fades as they travel into the distance. The reported behavior of the engines of the Senator’s plane indicates a serious failure of some aspect of the engine/propeller system. Indeed, the NTSB’s “Powerplants Group” investigated the engines, and particularly the propellers, in minute detail.75 Hartzell Propeller, Inc., is listed in the Final Report as a party to the NTSB’s investigation.76 (Pratt and Whitney Canada, who manufactured the engines, were not a party to the investigation, but provided a technical advisor. )77 The Powerplants Group found evidence of normal engine operation at the time of the crash, and the final positions of the pistons controlling the propellers to be at “flight idle” position;78 these facts were reported in the Final Report.79 No mention, however, was made of the witness reports of the change in engine RPM, nor of the fact that the propeller piston mechanisms revealed ten different markings indicative of being below idle position as the plane descended through the trees, which would give the plane almost no forward thrust.80 No analysis or explanation of these phenomena was offered in any NTSB documents released to the public. Another view of the remains of the wreckage, which fared much worse than the trees surrounding it. The NTSB claimed that the FBI was not a party to the investigation, but FBI agents were the first on the scene, and dominated the investigation of the site in the following days. Electromagnetic weaponry is highly advanced84 and would explain the loss of communications through the frying of electronics in the radios; but many of the systems on the Senator’s plane were actuated through mechanical linkages: this was a twin-turboprop plane built in 1979, not a computer-cockpit jumbo jet. Even the constant-speed propeller governor system was hydraulically and mechanically actuated.85 However, each propeller governor contained two solenoids (electrical switches) for both testing the unit and protecting against overspeed, with wires running to switches in the cockpit.86 An electrical fire in the cockpit that caused some or all of these solenoids to activate would have catastrophic effects and could cause the engines to almost shut down, as described by witnesses. This is, of course, but one possibility. The NTSB chose not to investigate any. Another view of the crash site, with both FBI and NTSB personnel on the scene. There is considerable confusion and intrigue surrounding the departure of the fatal flight itself. The Flight Service specialists who fielded two calls that morning, allegedly from Conry, failed to recognize his voice, and stated that the second caller—who filed the ultimate flight plan—sounded distant, unemotional, stressed and apprehensive.105 Both operators were surprised that he did not know the identification code for EVM, nor the direction of EVM from St. Paul.106 Calls on the morning of the accident to members of the Senator’s staff, the co-pilot, and Aviation Charter give conflicting accounts of whether the flight would be delayed or canceled.107 The NTSB was unable to resolve these discrepancies. If the possibility that someone may have been impersonating Conry was ever considered, it was never discussed in the documents released to the public. The NTSB’s own documents are replete with such examples of inconsistency, of promising leads puzzlingly allowed to go cold. There is little serious analysis of what actually occurred on October 25, 2002, and no consideration at all of the possibility that foul play might have been involved. The FBI clearly believed otherwise, expending considerable resources on this supposedly non-existent case. What they learned, alas, has yet to be revealed to the American public. Paul Wellstone deserves better. Nothing less than a full re-opening of the investigation is tolerable, if we are to pretend to retain any semblance of justice in the United States. Jim Fetzer, McKnight University Professor at the University of Minnesota, Duluth, is a former Marine Corps officer. The author of more than 20 books in the philosophy of science and on the theoretical foundations of computer science, artificial intelligence, and cognitive science, he has edited three books on the assassination of JFK as well as co-authored a book on the death of Senator Paul Wellstone. John Costella graduated top of his class in Honors degrees in both Electrical Engineering and Science, and has a Ph.D. in Theoretical Physics, specializing in electromagnetism. His contributions to the JFK assassination have established scientifically that the Zapruder home movie of the assassination is an inauthentic fabrication. He teaches Math at The Peninsula School, in Melbourne, Australia. 6 Public Docket: Meteorology Factual Report, Jan. 15, 2003; and particularly Addendum 1 to the Meteorology Factual Report, Feb. 6, 2003. 8 Public Docket: Air Traffic Control Group Chairman’s Factual Report of Investigation, Feb. 4, 2003, p. 9. 9 Public Docket: Attachment 1 to Air Traffic Control Factual Report, transcript of Princeton AFSS Preflight 11 position, Jan. 23, 2003, p. 6 of faxed document (attachment is unnumbered). 10 Public Docket: Attachment 2 to Air Traffic Control Factual Report, transcript of ATCT South Radar position, Jan. 31, 2003, p. 5 of faxed document (attachment is unnumbered). 12 Final Report, Sec. 3.1, Finding 12. 13 See, for example, John W. Fountain, “Crash Investigators Reconstruct Flight of Wellstone’s Plane,” New York Times, Oct. 28, 2002; Tom Majeski, “Weather, landing system are suspected causes,” St. Paul Pioneer Press, Oct. 26, 2002. 14 Public Docket: VOR Navigation System Group Chairman’s Factual Report of Investigation, Feb. 20, 2003, p. 9; VOR Navigation System Special Study, Apr. 9, 2003. 15 Public Docket: Attachment C to the VOR Navigation System Group Chairman’s Special Study. 16 Public Docket: Addendum 1 to VOR Navigation System Group Chairman’s Special Study, Nov. 10, 2003. 17 Final Report, Sec. 3.1, Findings 14 and 15. 18 Public Docket: Operational Factors Group Chairman’s Factual Report, Feb. 20, 2003, p. 17. 20 Public Docket: Operational Factors Group Chairman’s Factual Report, Feb. 20, 2003, p. 21. 21 Public Docket: Attachment 6 to the Human Performance Specialist’s Factual Report; Attachment 1 to the Human Performance Specialist’s Factual Report, p. 21. 22 Final Report, Sec. 3.1, Finding 17. 23 All times listed in this article are local time, Central Daylight Time (CDT). Many times quoted in the NTSB’s Factual Reports and supporting documents are in “Zulu” time, namely, Greenwich Mean Time (GMT), also called Coordinated Universal Time (UTC). To convert from “Zulu” time to CDT, subtract five hours. 24 Paul McEnroe et al., “Senator dies in crash,” Minneapolis Star Tribune, Oct. 26, 2002. 26 The NTSB interviewed at least four witnesses who heard or saw a low-flying plane that could not have been the Senator’s, based on their published flight path; see Public Docket: Survival Factors / Witness Specialist’s Factual Report, and particularly the map on p. 1 of Attachment 5 to the Airplane Performance Study. This corroborates Ulman’s statement to the press that he initially ignored the smoke. However, the NTSB interview summary with Ulman has him flying immediately to the smoke, which contradicts both Ulman himself and the witnesses. See Public Docket: Attachment 1-2 to the Operational Factors Group Chairman’s Factual Report. 27 Paul McEnroe et al., “Senator dies in crash,” Minneapolis Star Tribune, Oct. 26, 2002. 28 Public Docket: Survival Factors / Witness Specialist’s Factual Report, Feb. 13, 2003, p. 13. 32 Public Docket: Attachment 3 to the Survival Factors / Witness Specialist’s Factual Report, p. 1. 33 Public Docket: Survival Factors / Witness Specialist’s Factual Report, Feb. 13, 2003, p. 12. 38 Public Docket: Attachment 1 to the Survival Factors / Witness Specialist’s Factual Report. 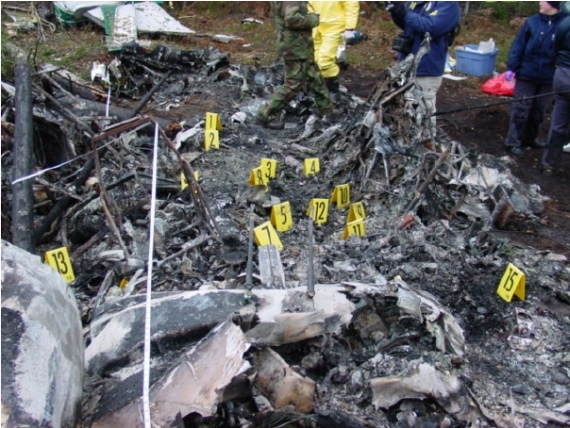 39 Public Docket: Airplane Performance Group: Crash Site Factual Report, Feb. 3, 2003, p. 2. 40 Public Docket: Attachment 3 to the Survival Factors / Witness Specialist’s Factual Report, pp. 10-11. 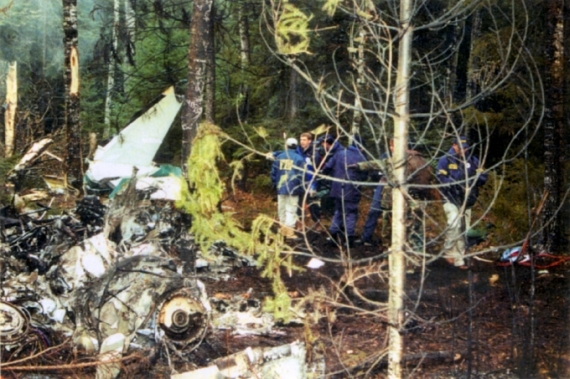 41 Public Docket: Airplane Performance Group: Crash Site Factual Report, Feb. 3, 2003, p. 2. 44 See, for example, Paul McEnroe et al., “Senator dies in crash,” Minneapolis Star Tribune, Oct. 26, 2002. 45 Final Report, p. 63. 46 See discussion of Zacharias Moussaoui, below. 48 American Assassination, p. 12. 53 Public Docket: Attachment 3 to the Survival Factors / Witness Specialist’s Factual Report, p. 11. 54 A curious feature of the 911 dispatch transcript is the censoring (blacking out) of a solid block of 30 lines of the Police record after 11:22 AM on Saturday, Oct. 26: Ibid., p. 3. 55 American Assassination, p. 14. 57 Public Docket: Attachment 3 to the Survival Factors / Witness Specialist’s Factual Report, p. 2. 64 Public Docket: State Police Helicopter Photos cover page, Taken Oct. 26, 2002 At the Request Of The Airplane Performance Group Chairman, and Photos #1, #2, #3, and #4, filed Aug. 23, 2003. 65 Public Docket: Air Traffic Control Group Chairman’s Factual Report of Investigation, Feb. 4, 2003, p. 5, supported by Attachment 9. 67 Public Docket: Attachment 1 to Airplane Performance Study, Mar. 24, 2003. 68 The NTSB asked Aviation Charter’s Chief Pilot, Alan Hoffert, for an explanation for this behavior. He could offer no explanation. See Public Docket: Attachment 1-39 to the Operational Factors Group Chairman’s Factual Report, p. 174. 69 Public Docket: Attachment 1 to Airplane Performance Study, Mar. 24, 2003. 71 Public Docket: Airplane Performance Group: Crash Site Factual Report, Feb. 3, 2003, pp. 5-8, Witnesses #1, #3, and #4. 73 Public Docket: Powerplants Group Chairman’s Factual Report, Feb. 19, 2003, p. 3. 74 See, for example, airmasterpropellers.com/wa.asp?idWebPage=3637 for a simple introduction to constant-speed propellers. 75 Public Docket: Powerplants Group Chairman’s Factual Report, Feb. 19, 2003. 76 Final Report, p. 63. 78 Public Docket: Powerplants Group Chairman’s Factual Report, Feb. 19, 2003, pp. 6 and 9. 79 Final Report, p. 26. 80 Public Docket: Powerplants Group Chairman’s Factual Report, Feb. 19, 2003, pp. 6-10. 81 American Assassination, pp. 47-50. 82 Private communications to Jim Fetzer. 83 Public Docket: Meteorology Factual Report, Jan. 15, 2003, p. 39. 84 Abstracts of unclassified reports of electromagnetic and other directed-energy weapons are listed in American Assassination, pp. 135-6, and include reports from the Department of Defense (1994), the Scientific Advisory Board of the U.S. Air Force (1995), the National Air Intelligence Center (1996), and the Royal Australian Air Force (1993). Current capabilities, of course, remain classified. In a curious coincidence, Raytheon, the fourth-largest U.S. defense contractor, now owns a number of patents for devastating electromagnetic weapons developed in the 1980s. It also owns Beechcraft, which manufactured the Senator’s plane. 85 Public Docket: Powerplants Group Chairman’s Factual Report, Feb. 19, 2003, p. 3. 87 Final Report, pp. 12-13. 88 Public Docket: Attachment 1 to the Human Performance Specialist’s Factual Report, pp. 27-28. 89 Public Docket: Human Performance Specialist’s Factual Report, Feb. 20, 2003, pp. 8-10. 90 Public Docket: Attachment 13 to the Human Performance Specialist’s Factual Report, pp. 1-2. Ironically, the doctor raising the charge of “falsification” refers to the required waiver certificate as a “wavier [sic]” 26 times, demonstrating himself how easy it is to make minor errors in paperwork. 91 Public Docket: Errata 1 to the Operations Group Chairman’s Factual Report, Mar. 4, 2003. 92 Final Report, pp. 8-10. 93 To avoid selective bias, one must read all of the 253 pages of summaries of witness interviews released by the NTSB. See Public Docket: Attachment 13 to the Human Performance Specialist’s Factual Report, and Attachments 1-1 through 1-47 to the Operational Factors Group Chairman’s Factual Report. 94 Public Docket: Attachments 1-27 to the Operational Factors Group Chairman’s Factual Report, p. 123. 95 Final Report, p. 10. 99 Public Docket: Attachment 1 to the Human Performance Specialist’s Factual Report, pp. 40-41. 100 Again, the complete set of witness interview summaries should be considered; see above references. 101 Public Docket: Attachment 23 to the Human Performance Specialist’s Factual Report. 102 Public Docket: Attachment 24 to the Human Performance Specialist’s Factual Report. 103 Public Docket: Attachment 1 to the Human Performance Specialist’s Factual Report, p. 20. 104 Final Report, p. 9. 105 Public Docket: Air Traffic Control Group Chairman’s Factual Report, p. 9-11. 106 This is particularly strange, given that 55-year-old Conry had lived in Minnesota for most of his life, had been flying since he had first gone up as a young boy with his father, and owned a PC-based flight simulator on which he and his co-pilots would practice takeoffs and landings on the weekends. 107 References to these discrepancies run throughout the NTSB’s documents, and an explicit list of citations would be excessive. 108 Public Docket: Attachment 1 to the Human Performance Specialist’s Factual Report, p. 44. 112 Public Docket: Attachment 1 to the Human Performance Specialist’s Factual Report, p. 35. 113 Christopher Bollyn, “Wellstone and 911: The Uncanny Connections,” The American Free Press, Dec. 2, 2003; thetruthseeker.co.uk/article.asp?ID=271. 115 Final Report, p. 14.